This week I’d like to ponder what it might look like to pursue a more profound preaching ministry. While most would acknowledge that preaching should neither be dense nor inaccessible, this does not mean that shallowness and dumbing down are the order of the day. 1. Begin with humble recognition that you yourself need to be changed by God. It is too easy to think of preaching preparation as being about you the preacher pursuing a message to preach to them, the needy recipients. At this point in the process you stand very much in their shoes, needing to hear from God. You need to encounter His heart in His Word. You need to be marked deeply and changed by a God who communicates, who cares, who challenges and who changes. It makes no sense to have profound faith for the sake of others, but not an openness and humility in yourself. The preparation of a sermon will be a privilege, an opportunity for God to mark your life profoundly. 2. Study the passage to know God, not just the facts. It is easy to treat Bible study as a pursuit of non-trivial trivia. Don’t. Study the passage in order to know God better. What is His self-revelation saying of Him? How are the characters responding to Him? Wherever you are in the canon, the passage is theocentric, so make sure that your heart is too. 3. Don’t mix your message preparation with your Bible study. As a preacher who cares about the congregation, or as a preacher desperate to be ready on time, it is tempting to blend passage study with message formation. Keep the stages separate. You have the privilege of doing some in-depth Bible study, take advantage of that! You may not be able to help thinking of who you will be preaching to, but try to keep those thoughts until you’ve really gotten to grips with the passage (or better, until God has gotten to grips with you through the passage). 4. Saturate your preparation in prayer. This should go without saying, but it can’t, so it won’t. 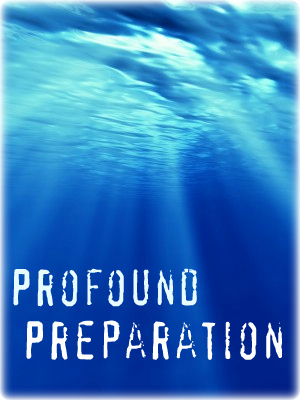 The entire preparation process should be absolutely pickled in prayer. Prayer in passage study, prayer in personal response, prayer in “audience analysis,” prayer in message formation, prayer for delivery, prayer for life change, prayer for immediate impact, prayer for long-term fruit, etc. Tomorrow I’ll offer a few more thoughts, this time on profound explanation in preaching. Feel free to comment any time. I would be interested in a definition of what is meant by ‘profound’. I suspect it is one of those words that means something different to different people. Thanks Peter, very helpful. I’m looking forward to this week’s series! Wow, this is excellent. “Wherever you are in the canon, the passage is theocentric, so make sure that your heart is too.” That’s a great line. Thanks Jon – I tend to agree…if we care about our listeners, then we will naturally be concerned for them. Nonetheless, trying to distinguish the two phases of passage study and message formation is worth it for the benefits in terms of accuracy in passage study. If God has made you a teacher, He’s made you one who will have sermon formation thoughts during exegesis. That’s a gift we shouldn’t scorn, but we need to make a note of those thoughts and move on with nailing down the exegesis before we really shift into homiletical thinking.